news Labor has announced that, if re-elected, it will offer new guidance to innovation and entrepreneurship advocacy group StartupAUS to help boost the role of regional Australia in the nation’s innovation effort. Ultimately, the Opposition said, the plan is hoped to help increase job growth and support new firms beyond the nation’s major metros, and would try to maximise the economic benefits generated by the availability of high-speed broadband in regional Australia. 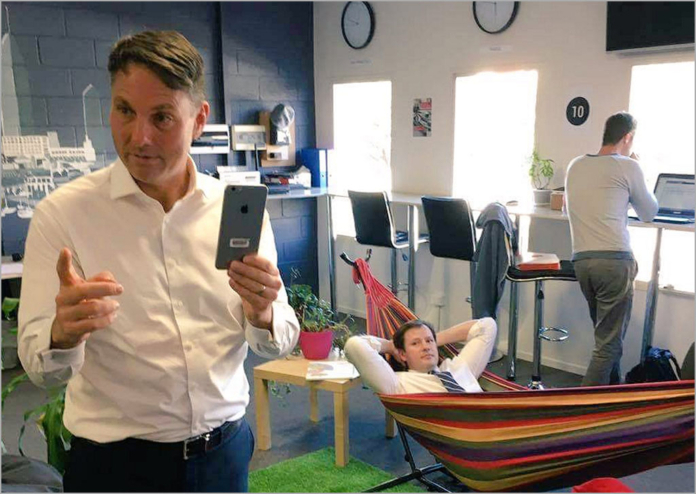 Shadow Parliamentary Secretary for Digital Innovation and Startups Ed Husic (pictured, in the hammock) made the announcement while touring Geelong-based business incubator Startup Cloud, along with Richard Marles, Federal Member for Corio (also pictured), and Libby Coker, Labor candidate for Corangamite. In a statement, Husic said that, by 2030, it is estimated that two out of every five Australian jobs will be affected by automation. “This means we need to invest now in developing the skills needed for the jobs of the future, especially if these high skill, knowledge jobs are to emerge in regional Australia,” he said. With two thirds of new early stage innovation firms emerging from Sydney, though, he stressed that “greater focus” needs to be placed on plans to involve the entire country in its drive for innovation. In May, the Turnbull Government announced it would provide $360,000 to StartupAUS for broad-based research into entrepreneurship in Australia. However, Labor said that funding needs to focus more on work that will have a “meaningful impact”, and on finding ways for regional Australia to generate new firms and jobs outside the major cities. A re-elected Labor Government would require that the $360,000 provided to StartupAUS would be directed towards devising a strategy to “boost the emergence of regionally based innovation communities”, said Husic. Effectively, Labor would expect that StartupAUS would bring together startup founder and investor expertise within Australia to draw up an “effective game plan” to boost regional innovation activity. This work would also look at the experiences of other countries in accelerating the growth of regionally based innovation communities and “apply the lessons learned for the benefit of regional Australia”. This will have the added benefit, Labor said, of guiding investments made via its planned Regional Innovation Fund – a scheme pledged by the party last year. The $16 million fund was proposed to act as a platform for the creation of up to 20 new regional innovation hubs, provide seed funding to startups and help build regional expertise to guide these new firms. Labor said the 20 hubs could address skills and experience gaps by having established entrepreneurs team up with regional accelerators and mentor new startups. Further it could allow university-based accelerators to offer seed funding for student-led startups on a competitive basis to support prototyping and early proofs-of-concept. 1. From my experience StartupAUS is not seen by the sector as the overarching representative body it seeks to be. It will need to become more inclusive if the government’s money is to be well spent. 2. We will need to significantly improve the rollout of the NBN is we are to boost innovation in the bush. Interesting policy. I think everyone would agree that regional areas need a boost and it’s good to see parties finally thinking about it. We will need to significantly improve the rollout of the NBN is we are to boost innovation in the bush. This is potentially a landmark policy shift. There is an incredible ammount of innovation and Startups that happen in what we call regional Australia. In my extensive travels across the regions I’m constantly amazed by the high innovation levels. They don’t often formalise their “Startup” or “innovation” status – as that is not the focus. Their focus is always on customers and solutions that work. This would go a long way to explaining the often quoted Sydney/Melbourne Startup statistical bias. Ed Husic visited the NSW Central Coast last month to talk to our digital innovations group at our Gosford Cocktail Bar meet. He was an impressive and informed character and listened to our concerns. In the room were innovators that had built $100’s of millions of dollars of revenue and profit in their respective businesses. However only 2 had bothered to market themselves as Startup Innovators. A few were now private Startup angels however.